Two posts in one week! As promised another finished knit. I started this sweater in March, but there was not much motivation to finish it in the heat of the summer. By the time he needs it, I think it might even fit. It's big enough that it should last at least until next spring. 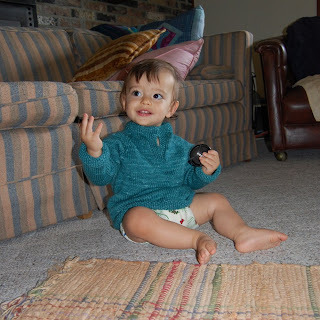 The pattern is the Child's Placket Neck Sweater. This is the third one I've made so far and probably won't be the last. I dyed the yarn myself too. I love kettle dyeing, there is so much variation in the color without it being busy. In the pottery world, it seems to be the summer of the berry bowl. (They are upside down here) All the galleries are selling them as fast as I can get them in. I've got 18 regular ones for the next firing. There are a few smaller ones in the picture, a special request from Janice. And of course when I need one I always make 3. I just like the way mugs look all lined up in a row. When they are dry but haven't been fired they are very soft in look and feel. 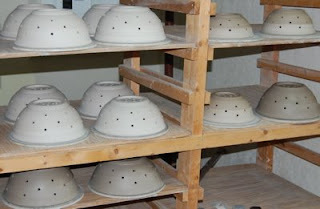 Both shelves looked even more impressive, but there is a big batch cooling in the bisque kiln. It will still be several weeks before I have enough pots for the big kiln and the final glaze firing. you're not kidding about the berry bowls. Must be a nation-wide craze because I can't make them fast enough! Hey Sarah, the berry bowls look great. I think I should make a few. It's been a great summer for berries.